Continuity mistake: When the jumper shoots Kuffs before going off the ledge, pay attention to the trajectory of the bullet fired from the gun and then to the bullet wound that Kuffs shows us in the taxi cab. They don't match. If the bullet got him where it was supposed to, he would've been hit in the hip/upper thigh area, instead of the side of his abdomen like in the cab. Continuity mistake: After the Chinese Laundry blows up, Kuffs and his partner hail a cab, which is a red Ford Crown Victoria. Notice the shape of the back window. In the next shot from inside the cab, the car is totally different, more like an old style car with a rounded rear window. It's not the same car. Continuity mistake: At the top of the parking garage, after the shooting starts, a bad guy jumps into a yellow van with a rear view mirror on the windshield. When he starts to back up, the rear view mirror is gone, but in the next shot the mirror is back. Continuity mistake: From the point that Ted comes into the Chinese laundry to the time that He and Kuffs jump out of the window, the clock on the bomb showed that there were four seconds left till detonation. That surely would have not been enough time to untie Kuffs from the chair and make the quick getaway. Continuity mistake: When Kuffs' partner decides to save him from the bomb while sitting in the middle of the road, he turns the car wheel as to make a sharp right, but makes a left when it shows his actual turn. 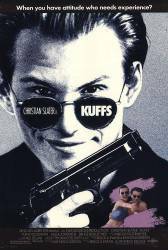 Continuity mistake: Kuffs is shot in the abdomen and shows the bullet wound to be just above the waist line of his pants in the cab, but a few scenes later there is a montage of him getting ready for his dinner with Maya and Kuffs is dancing around with no shirt on revealing that there is no bullet wound. At the end of the montage Kuffs lays down on the bed and the bullet wound is back. George Kuffs: I got women to do, places to see.